Ours not to reason why. 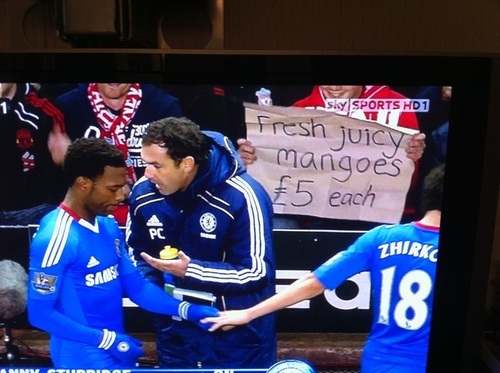 A fiver seems a bit steep though, no matter how juicy they are. PC is asking Sturridge if he’ll lend him a fiver. what does it mean? it’s so fresh, so juicy. It’s not racist in the slightest, the guy is a good mate of mine, and it was a bet he had with one of our other mates pissed from Saturday nite to come up with a random sign that’s all, why does everything have to be racist just because there is a black guy in it. If u watched the game u would of seen he had it up for every substitution..
so what is this referring to? ok lets disect it like this ,, you need to ask you’re self 3 questions ..
1. its not mango season where does he get them from ? 2. why has he misspelt the word mangos with man/goes ? 3. why are they so expensive ? @jam jam. Good disection, but he hasn’t misspelt anything, it can be mangoes or mangos, either one is fine. As for *dissect*, well that’s a different matter.